Emma’s blog is one that I have admired for a long time now. She is an alternative gal with a goth side just like me, so if you haven’t checked out her site or her YouTube yet then you absolute have to! She blogs about travel, beauty and food as well as fashion. We chat about her blog, style and more. When and why did you start blogging/ making YouTube videos? I started blogging 2.5 years ago and started my YouTube Channel a year after that. I have always been a creative person and, after securing a 9-5 office job, I felt like I needed somewhere to express myself. How did you figure out what you should blog about? I am still figuring out what I should blog about now. My blog is a reflection of my life and the things I love so it changes as I do. I am passionate about so many things I find it hard to niche down. Why do you think you have such wanderlust? I have been an adventurer since I was a tiny child. I think maybe it has something to do with watching far too much Star Trek and Westerns with my grandparents. I absolutely love opening my mind to new ideas and exploring new places. When I travel I truly feel free and am always counting down the days until my next adventure. How do you organise your time working and travelling and blogging and YouTubing? In truth, really badly. I wish I was a bullet journal, list loving kind of gal, but I live in organised chaos. I find it hard to force creativity so I write, film, and edit when I feel like it and then schedule. I usually feel most inspired when travelling so have gotten used to opening my laptop when on holiday. It was all getting a bit much so I have recently made the decision to quit my job to follow more creative pursuits which should hopefully help me be more consistent with my content. 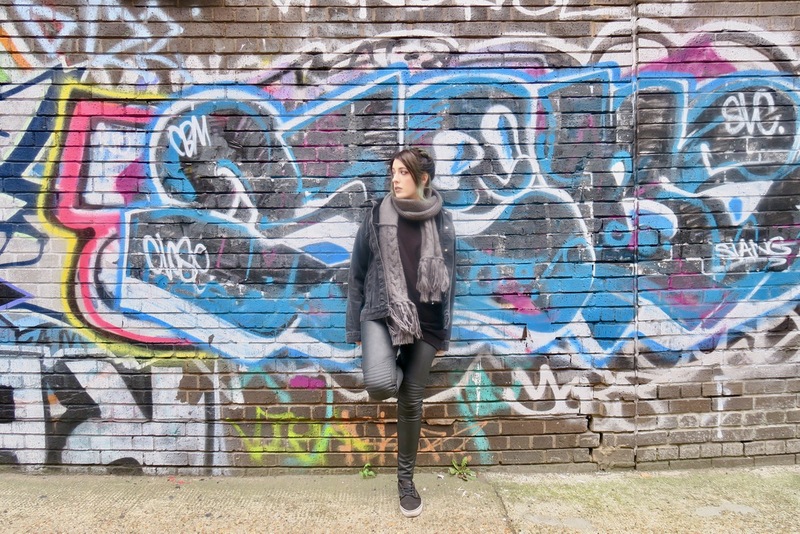 I would love for people to feel a connection to my blog and for it to become their go-to for finding different places in London, exciting places to travel, or somewhere they could go on a bad day to feel inspired. Engagement is way more important to me than numbers. 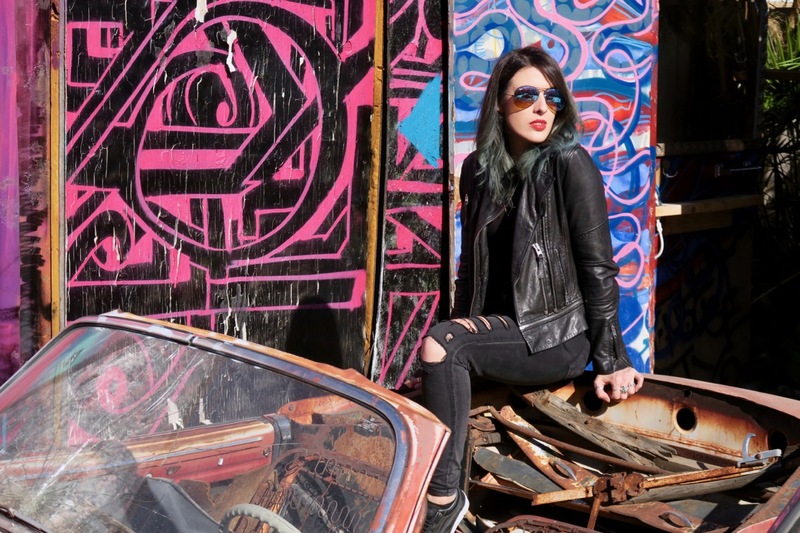 My style, like my blog, is a reflection of the things I love; it is a mix of classic rock, biker, with a splash of 90’s. What tattoos are you looking to get next? I want so many more tattoos but I think my next one is going to be a traditional style heart with a banner saying “brave heart”. It not only represents my Scottish roots but brave heart was also the name of a horse in one of the westerns I used to watch with my grandparents. I usually get tattoos to represent milestones and I am hoping this will give me strength in my new endeavours, which I know will be tough work. I pull my style inspirations from all sorts of places: the street, bloggers, skate, music, and cities like New York and London. In terms of famous style icons; Cher, Madonna, Rooney Mara, Kristen Stewart, 90’s Drew Barrymore, Lady Gaga, and Frances Bean Cobain are all women whose style I love. I like to play around with a mix of vintage, high street, and designer so again this list could be long! Right know I am loving: The Ragged Priest, Vans, Weekday, The Great Frog, Alexander McQueen, Versace, and Saint Laurent. Is your bf your Instagram husband like mine is? Yeah he is great, I am really lucky that Pablo has an interest in photography and filming and is always willing to help me out. I come up with the concept and direct him but he does the technical bit which makes for a great team. Which people/brands do you think are on fire at the moment? I kind of answered brands above but bloggers I think are on fire right now include Zoe London, Foxxtailz, Popcorn and Glitter, Amy Stardust, India Pixie, Masha Sedgwick and Love From Berlin. You’re very honest in your writing, where do you find the confidence to be so open? I think I just got to a point where I stopped caring about what other people think. I write because I feel the need to express myself and I’m unapologetic in doing so. Do you struggle with body image and if so what do you do to combat it? Absolutely. I have had a terrible relationship with my body and don’t think I will ever reach a point where I am 100% comfortable with myself. In saying that, my mentality about my body has changed over the past few years. I no longer see it as something to fight with but the vessel that enables me to do the things I love. This switch has made me much kinder to myself and has made me a lot more confident. Thank you so much Emma! Go check out Emma Inks the blog here, her YouTube here and her Twitter here.